And so the child who once wouldn’t wear a hat or a hood or a cap, no matter what the circumstance, is now the teenager who wears his hood up and tied securely around his face. I have several photos of him, several weeks in a row, sitting in the back on car ride (he hasn’t been coming in to Andy’s apartment for his visits lately). In each photo he’s got the blue coat on with its hood up. Last Sunday while parked in Andy’s driveway, Jonah declared blue shirt on? – so Andy went inside and changed into one of many blue shirts he keeps in a special place for just such a request. Thus appropriately garbed, he got back in the car and prepared for another ride. My mother, who stays back at the apartment for these rides, visits Jonah in the car when we come back and park after each loop. Nearly always she has a cheeseburger and fries, and this week she’d brought him 4 Thin Mint Girl Scout cookies as well. 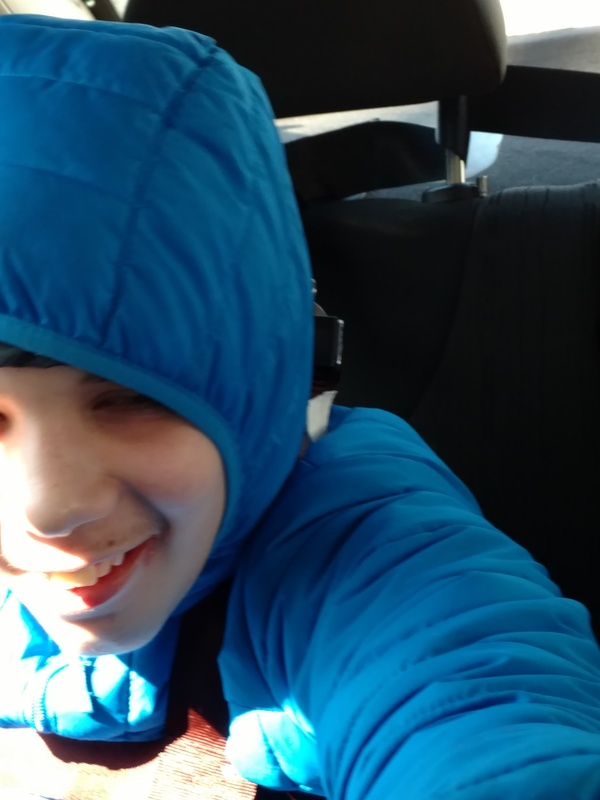 Jonah has been happy, silly, all smiles and loving his rides, rocking in his seat to hip-hop and Top 40, wanting it as loud as we’ll allow. On? On?! (It means louder, please in Jonahspeak). There is a CD of dance music I made for him more than ten years ago now, and he asks for it by requesting Mama CD? Week after week, once this particular CD is in, he requests 3 specific numbers of song tracks and then says all done mama CD. This time, however, we pulled into the driveway during the 3rd song – and, distracted by grandma and cheeseburger, Jonah wasn’t on top of his DJ game so the CD continued to play. I didn’t know he could even see the track numbers on the dashboard CD display, but when Andy got back in the car for a second loop, Jonah piped up: 13? Andy went to track 13, the song Funkytown came on, and Jonah wanted it louder right away: On? When it was over he said 13? again. And again, and then once more, before deciding he’d had enough talkin’ bout moo-ooo-vin’ and wanted some radio. Last weekend I was fighting off a migraine and had to cut my visit one loop short because I couldn’t take another song. Hopefully, with the coming of the springtime we’ll get him out of the car and into the apartment or over to the park, even. For now we’re all just collectively grateful he’s been good. His move to the new residence seems to have coincided with the good, though I hate to play the cause and effect game, as it proves faulty at least some of the time. Grateful are we, as always, to the caregivers at his residence and school. Last week I walked down to the Capitol and joined hundreds of other parents, care workers, and clients for the Be Fair to Direct Care rally. We are asking Governor Cuomo to include at least 45 million dollars in the budget for an increase in pay for direct care workers throughout New York State. 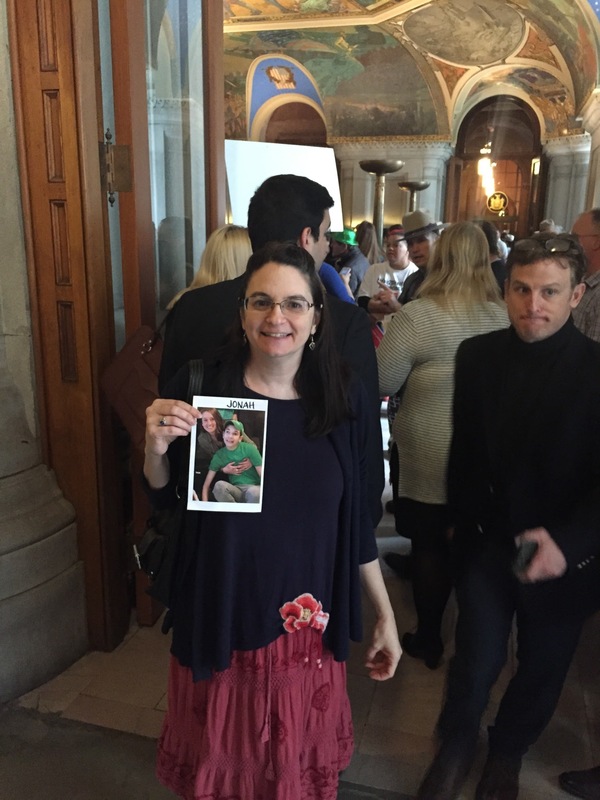 Anderson parents were asked to bring a photo of our child, so I came with Jonah’s picture and cheered with the others when the Governor himself, in a rare personal appearance, came out to address the crowd and promise he wouldn’t sign the budget without the requested money in it. Direct care workers deserve fair pay – excellent pay, even – for they protect, feed, clean, play with, and comfort our kids. They deal with all manner of random issues working with them – things that are frightening, or gross, or just plain exhausting. I was proud and honored to be a part of this effort on their behalf. Jonah and I say thank you to all caregivers everywhere – and Happy Spring to you all!